A little book of inspiration, humour and reflection. 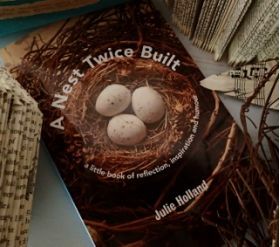 This book of verse is the first in a series by Queensland author Julie Holland (co-owner of Hearts and Minds Art). Julie was inspired to collate many of her inspirational verses after chatting with customers, and realising the contribution they could make to others' lives. These verses can also be personalised by Julie within her Tree of Life art series (see section under JULIE'S WORDS).